This is a view of four office workstations, custom designed Drive electric height adjustable desks with specially produced mobile caddies. 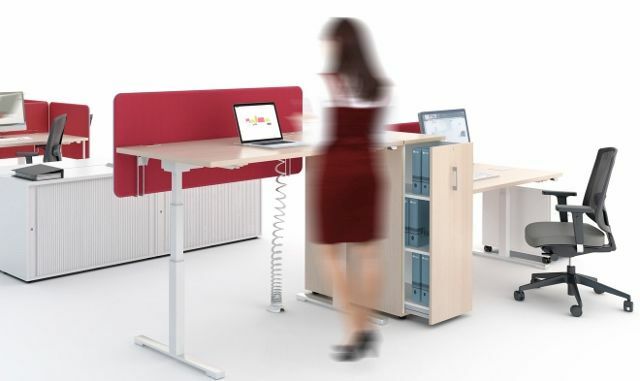 This image shows the sit stand desks in their stand up position, prior to the Customer's staff moving in. 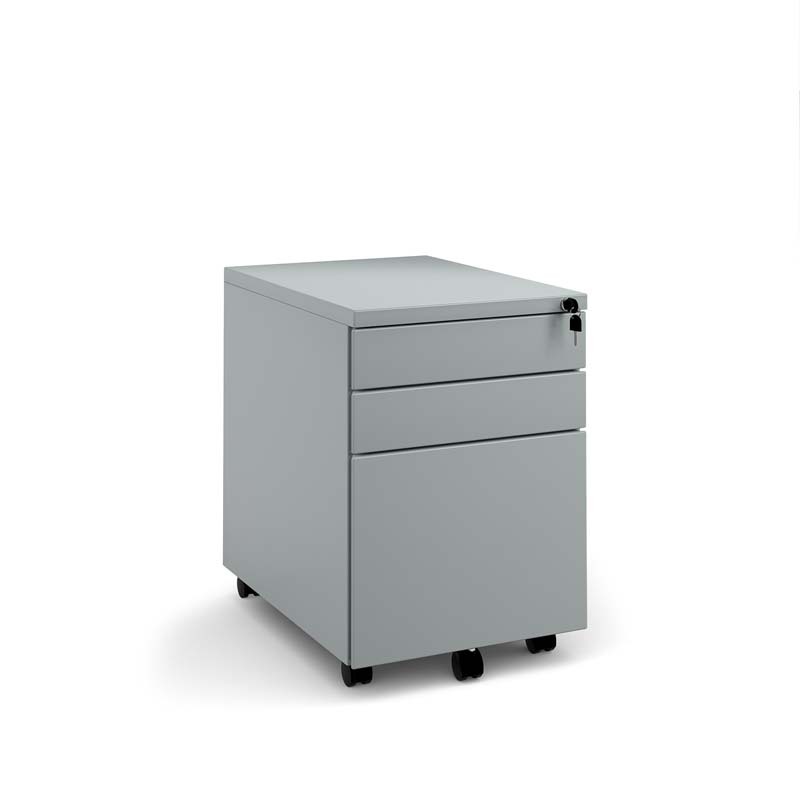 Working with the Manufacturer, Aerofoil helped design these special mobile storage containers, or tall pedestals (caddies). 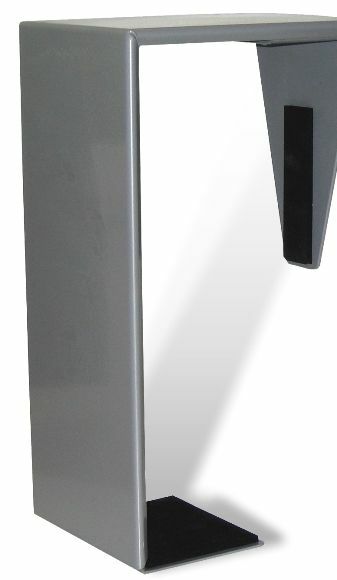 Each unit has 50mm lockable castors so they can be easily moved. 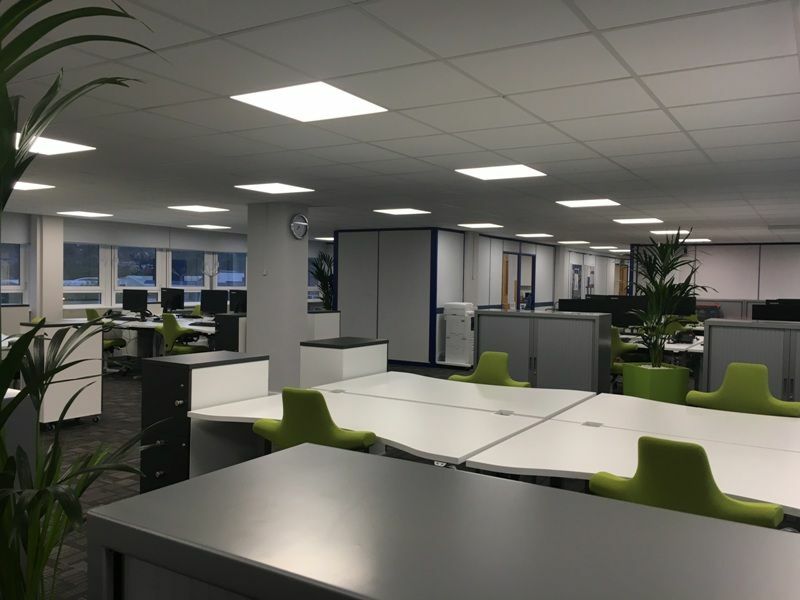 The black and grey of the carpet tiles and the white, anthracite and silver finishes on the office desks and tall pedestals are vibrantly enhanced by the lime green seating fabric and the Customer's matching planters. It is visually stunning. 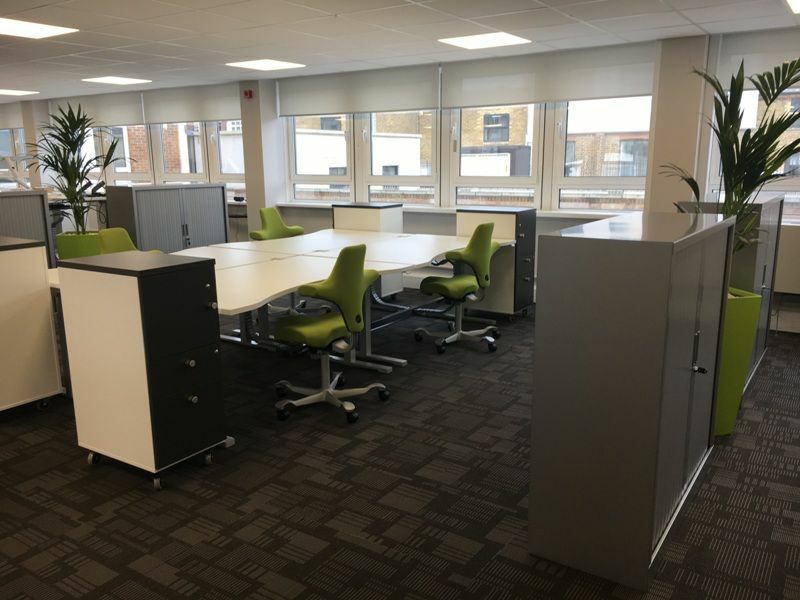 These Hag Capisco chairs are fitted with extended gas lifts so that staff can use them at a normal seated height or to perch on them when working at higher levels with the height adjustable desks. The Lime Green fabric enhances the overall design. 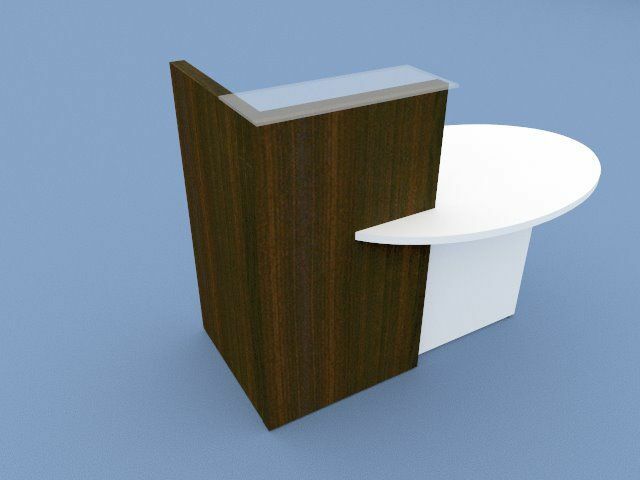 The different office teams are partially separated by planters and silver side opening tambour door cupboards. 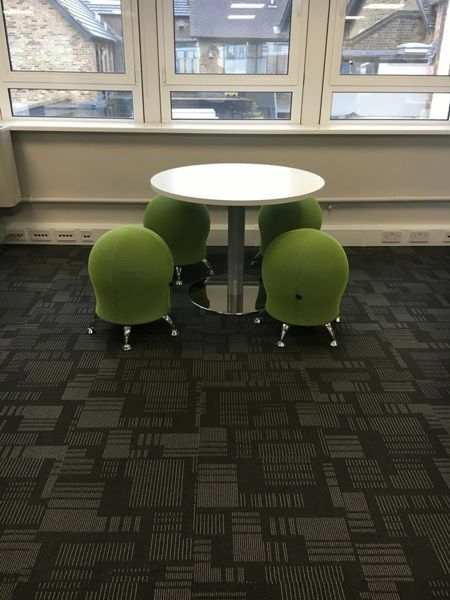 The Customer Service team tend to be talking on the phone more regularly, so this group were given lime green acoustic absorbing dividing screens. Staff are not the same size. They also differ as to whether they want to sit and work, or maybe stand up and work for part of the day - something that has proven benefits. 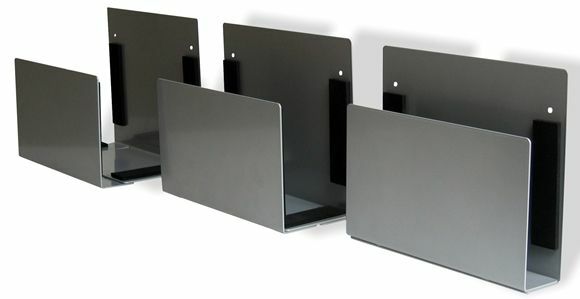 With these custom designed double wave desktops, and electric height adjustable frames, they can make their own choice. The use of geometric patterned carpet tiles, with neutral whites and anthracite grey furniture offers a very modern office design. This is a view across this Maidstone office installation. 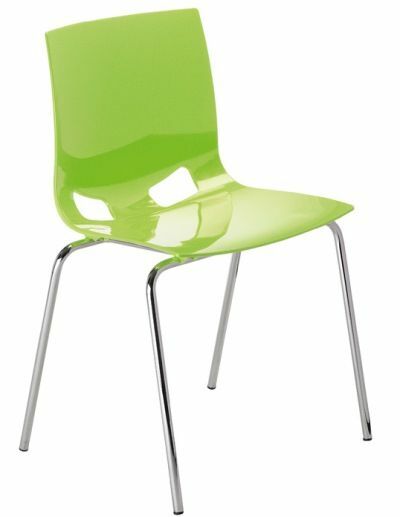 The lime green Sitness stools add more vibrant colour to the office design. They allow staff to exercise whilst they sit and meet, as the exercise ball stools flex whilst remaining stable on the floor. This meeting room is furnished with a barrel shape conference meeting table, sitting on pedestal bases that have stainless steel footplates. 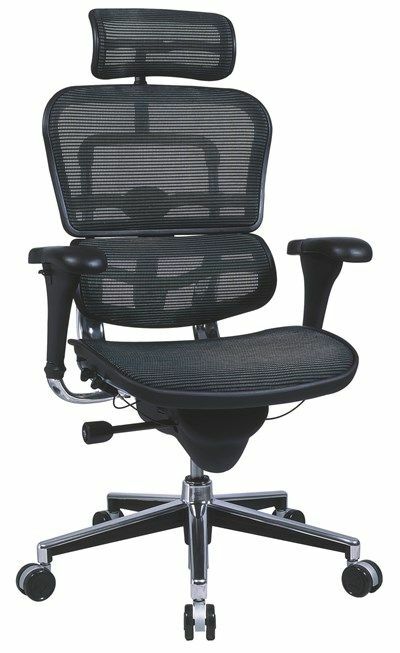 The Key cantilever frame meeting chairs are upholstered in anthracite Just Colour faux leather. The Bing tub chairs have been upholstered in a combination of Camira's Halcyon range. Soft to the touch, and stylish to look at, it is hard to tell that Halycon is a wipe clean vinyl upholstery. This office floor does not have floor boxes or power in the floor, so a system was designed to run cables across the floor from the perimeter. 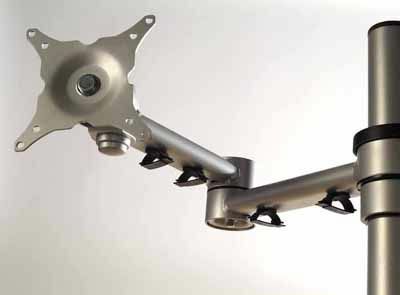 This was carefully worked out to connect to the vertical cable management. 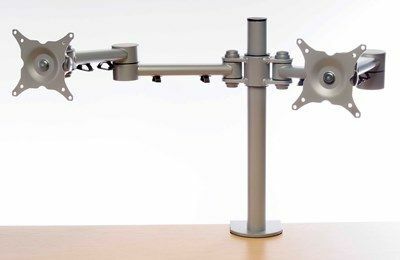 These cable spines connect to the trunking and magnetically clip to the desk frame, allowing cables to be kept tidy even when the Sit Stand desks are raised to standing heights. These tambour cupboards over three levels of shelf filing, hidden behind silver finished plastic tambour doors. Every workstation has underdesk power and data sockets, fed by power cables from the office perimeter. The cable management hides this away perfectly. Aesthetically pleasing, and generally safer.